DO YOU yearn for adventure? Do you wish you could do something to give back? Consider an international trip to volunteer at an animal shelter. Anyone can volunteer. 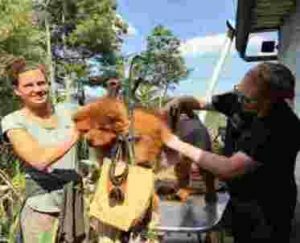 But a highly specialized skill like dog grooming turns out to be an incredibly valuable way to do good in the world of dog rescue – as I learned on a recent volunteer vacation to Guatemala. My internet search for “travel and volunteering with animals” turned up Animal Aware — the largest dog (and cat) rescue in Central America. 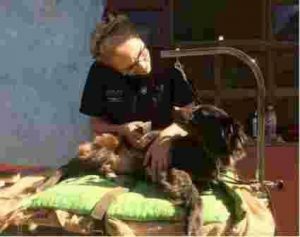 Located in the mountains outside the picturesque Spanish colonial city of La Antigua (a UNESCO World Heritage site), Animal Aware seemed like the perfect combination of an interesting destination and a shelter in great need of help. Panic was setting in as we walked through a variety of chain-link, cement floored pens spread over many hilly acres in the woods. Three hundred dogs and sixty cats were housed here and while most looked just fine, some were in really bad shape. The two young women giving me the tour were both volunteers (Erin from Canada and Julia from Germany) who had arrived a week before I did. 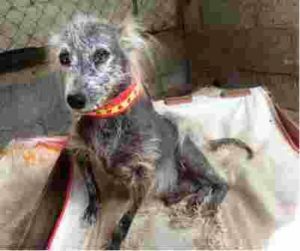 They showed me a list they made of over 30 dogs they felt had an urgent grooming need and each was ranked – from bad to worst – either matted to the skin with urine, mud and feces; infested with fleas; hairless and scabby from underlying issues; badly overgrown nails, or a combination thereof. 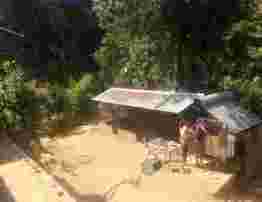 A large shelter such as this is staffed with a skeleton crew of local people who are so busy feeding, walking, watering and cleaning that they have very little time to be trained in bathing or nail clipping. Yes there is a stream of sporadic visits from international volunteers but without special skills or some training they cannot address this need. AWARE simply does not have the resources to employ qualified people to help the dogs with these specific issues on a day to day basis. Thank god I brought my own equipment. There was nothing set up for grooming. Time to adapt and improvise! The building that housed the clinic was not an option as it was filled with stacked crates full of dogs and had no good overhead lighting. We carried a narrow steel operating table from inside the clinic and outfitted it with a grooming arm and an old feed bag wrapped around it with leashes to provide a solid spot for dogs to stand. We put it up on cinder blocks so it was a good height. This was my headquarters arranged outdoors on a semi-shaded side of the clinic building. Mornings were cool and comfortable but sweat and sunburn were the norm every afternoon. At least it wasn’t the Rainy Season! As I set up my stuff around the grooming table, Erin and Julia went out into the pens to find the worst dog on their list. They returned with a purebred Chow named Nasha. Tears filled my eyes when we put her up on the table to see what we were dealing with. 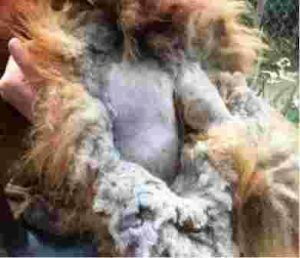 Her coat was so tightly matted that I could not get anything but an almost surgical length blade under the hair. 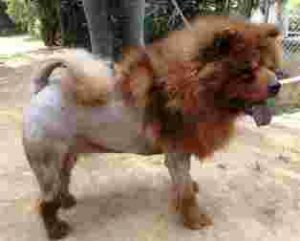 The change in Nasha’s demeanor after her painful coat was shaved off was remarkable. Before her groom, she was just a big lump in the corner of her pen –barely moving, no expression in her face. Once we got her down off the table to go back to her pen she was wiggling furiously and wagging her tail, spinning in circles, hopping and jumping up on us, nosing our legs, mouth open with a big smile. What a wonderful feeling to have improved her life. We continued with this routine for the rest of the week. Each day we progressed down the list so the grooms got easier and the issues were slightly less heartbreaking. I showed Erin and Julia the best ways to brush, trim nails, and bathe the dogs so they helped me immensely. If they had not been there to help me—holding the wiggly dogs on the table, running to and from pens with dogs, bathing them after they were clipped—I could not have accomplished anything near what we did working together as a team. I wished I had more time to interact with and learn from the local guys on the shelter staff, but the time limit of one week meant there was so much to do and so little time to get through as many dogs as possible. There were only four or five guys each day to care for nearly 400 animals. I would have liked to leave them trained in nail trimming, proper bathing and conditioning, and how to identify which dogs need these things. Next time! I had the weekends before and after this volunteer week to explore La Antigua’s historic churches and ruins, the open air markets, the surrounding volcanoes and some wonderful restaurants and street food. The city is touristy but also uniquely geared toward volunteers. Certain restaurants even offer weekly “Volunteer Nights” that encourage meeting and sharing experiences with volunteers from all over the world.